Create a contraption and propel it across islands with wide gaps using your own creativity. 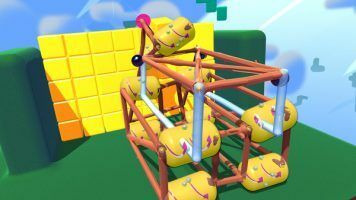 Fantastic Contraption lets you design & build so go try it out. You don’t have to be an engineer to make that perfect vehicle for the job. Fantastic Contraption is this surreal virtual reality game that gives the HTC Vive a whole new purpose. Given the capabilities of the hardware and the nature of the game, which is crafting, it makes up a great puzzle game that makes you think hard. This is basically a puzzle game where players will craft ‘contraptions’ to overcome gaps between floating islands and pass through walls to advance to the next higher level. So if you have that knack for creative tinkering and a great experience building with Legos, this VR game is definitely down your alley. This won’t be for everyone, but if you’re that person who wants a mental challenge, this game is worth to look at for your HTC Vive. Many pros for Fantastic Contraption. On top of it is the design of the world. It’s not meant to be realistic and it’s not trying to be. With kittens and flowers and other colorful bright pastel colors will certainly appeal to the feminine players. But disregarding the look, this VR game is all about crafting in HTC Vive. Much like Minecraft, you got some beams and wheels to freely build any type or shape of contraptions your mind can come up with. The non-restrictive nature of the building is an amazing feature. Once you get the goal of the whole building process, the game actually feels like second nature. Like you are in a real space creating something that is supposed to accomplish something. That’s what virtual reality is trying to do and Fantastic Contraption has done a great job leveraging to that true VR goal. Oh well, Fantastic Contraption could use some improvements on the graphics side of things. Although they are designed intentionally that way but maybe a few setting options on the virtual reality space could help the game be better. Let’s start with the graphics. Well, it is good to start with but the color seems off when you think of reaching out gamers who have been playing a lot of crafting games before. Maybe toning down some of the colorful fancy stuff or adding a few worlds with a different vibe would be nice. Like a theme or an environment. Next is the physics of the game. The contraption falls off the cliff seems convincing but maybe adding some new materials like steel beams would give a much stronger contraption. Just imagine going across that cliff without your contraption breaking midway.